The Design Automation Conference, being held this week in San Francisco, seems a subdued affair from those a few years ago. This year, I am helping a friend man the FTL booth due to the scheduled person coming down with the dreaded swine flu. Although I have walked around and seen al the other booths, time has not allowed a detailed examination of any of their offerings. However, I was impressed by one company and its CEO. Micro Magic is in the booth next to FTL so there was opportunity to learn what they are about. They have a suite of IC layout tools that is impressive in its performance and capacity. I will not go into detail, I have to catch a train back to DAC, but I recommend checking them out if layout is your thing. The CEO, Mark Santoro, is a straight talking guy who was able to push all my hot buttons – and don’t even do layout. If you are around DAC today (Wednesday) please stop by the FTL booth and say hello. The 46th annual Design Automation conference takes place at the Moscone Center in San Francisco July 27-30. It will be the 20th conference for me and I have to admit I am not as excited about going as I was in the early ’90s. Back then it was a much broader conference with papers about FPGA design and PCB interconnect timing modeling. Now there is little other than chip design. Not that chip design isn’t exciting – its just not what I do. I suspect most EEs are not chip designers either. However, I suspect the bulk of the revenue being taken in by the EDA companies is related to chip design. That said, I will still attend DAC this year. It remains the single best conference for meeting industry folk that I tend to meet only once a year. While I head off to DAC each year with mild enthusiasm and low expectations, I have always come back with more new contacts and useful information than I had anticipated. So, once again, I will see you at DAC. Don’t miss the Denali party! This year’s attendance at Denali’s MemCon seems at least as big as last year’s. I don’t have actual numbers but the presentation hall was nearly full – and it is a big hall. I found the first two presentations to be the most interesting. The first was by Ed Doller, the CTO at Numonyx. Sorry about the photo, Ed. Ed talked about Numonyx’s new Phase Change Memory (PCM). PCM is a non-volatile memory technology that is about 100 times faster than flash. It is also about 1,000 times more durable – and when failures do occur, it is during write cycles, when corrective action can be taken. Power requirements are similar. For now, it looks like PCM could find a niche as a new level in memory subsystem architecture. Its future will depend on density and price improvements. Numonyx has been the sole supplier of phase change memory until today, when Samsung announced they will be producing pin compatible devices. Energy harvesting, the ability to extract energy from the ambient environment, is becoming much more of an enabling technology. This is not so much because energy harvesting techniques have improved as it is because low power electronics have progressed to the point where very small amounts of energy are now useful. Micro-controllers and RF modules can now run on micro-amps of current and extremely low duty cycles. Applications demonstrated ranged from wireless sensor meshes to wireless light switches. Synapse held a press conference to announce partnerships with Panasonic and CEL. Synapse has products in the mesh networks space that include RF modules, the SNAPconnect protocol and the Portal SDK. Their products interoperate with other vendors and make developing a mesh application easy. In fact it makes it look fun. I wanted to go out and look for an application just to try it out. 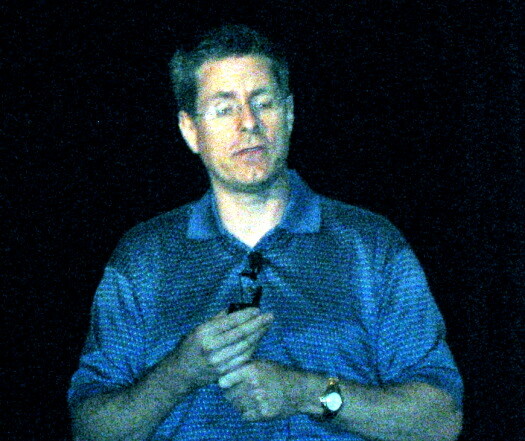 Richard Munden began his career in EDA in 1988. He soon became interested in board and system level simulation and has been beating that drum ever since. He is auther of the best selling (and only) book published on VHDL/VITAL and component modeling, "ASIC and FPGA Verification: A Guide to Component Modeling" (Morgan Kaufman Publishers, ISBN: 0-12-510581-9). He believes everyone should have two copies.